Are you interested in learning how yoga can improve your overall health? As a Physical Therapist and a Certified Yoga Instructor, Kristen Veres primarily utilizes the body movement and breathwork aspects of Yoga to affect significant, lasting changes to a patient’s health. As a Physical Therapist and a Certified Yoga Instructor, Kristen Veres primarily utilizes the body movement and breathwork aspects of Yoga to affect significant, lasting changes to a patient’s overall health. This may look as simple as adding a yoga stretch to the Home Exercise Program, guiding a patient in the correct breathing pattern during a functional movement, or retraining activities with yoga’s sequences of movements. Yoga moves energy through our bodies, thus transmitting and transmuting patterns of stuck dis-ease left over from our life’s experiences. The movements and postures of Yoga stretch, strengthen, stabilize, and re-educate the body in proper alignment and functional mobility. Integrating Yoga into a physical therapy treatment program serves to enhance the healing experience, as well as empower the individual to continue integration at home. 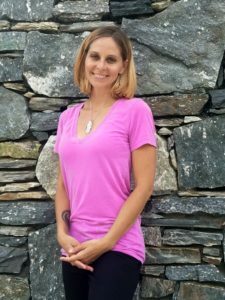 Kristen is a Registered Yoga Teacher, certified by Yoga Alliance in 2016.